Enjoyable slacker comedy with likeable characters, a steady stream of decent gags and strong performances from a superb comic cast, though it's fair to say that not all of the jokes work and those averse to Family Guy are probably well advised to steer clear. 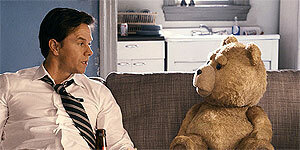 Written and directed by Family Guy creator Seth MacFarlane, Ted stars Mark Wahlberg as John, a 35 year old slacker who's inseparable from his pot-smoking, womanising best friend Ted (Seth MacFarlane, sounding exactly like Family Guy's Peter Griffin), a talking teddy bear he wished to life when he was a lonely child. However, after John fails to propose on their anniversary, his long-term girlfriend Lori (Mila Kunis) decides that John might do better in life if he was separated from Ted's bad influence. Initially, Ted agrees and gets a job in a supermarket in order to keep Lori and John happy, but things don't quite go according to plan. Mark Wahlberg is a highly underrated comedy actor and he's on terrific form here as essentially the dopey straight man to his furry, wise-cracking co-star. MacFarlane is equally good as Ted and it's a testament to both the voice and the superlative special effects work that you completely buy into the character, despite the high-concept fantasy premise. There's even a clever montage that details Ted's early life as a media sensation before, like a child star gone off the rails, obscurity hits in later life. In addition, Kunis is typically adorable as Lori and there's strong support from a superb comic cast that includes Joel McHale (as Lori's predatory boss) and Giovanni Ribisi (as a creepy stalker), as well as a host of inspired cameos, especially if you're a fan of a particular 1980 movie. Similarly, the witty script keeps the gags coming thick and fast but also manages to work in a surprisingly moving central theme about friendship and what it means to grow up. That said, the script doesn't put too much effort into the writing of the relationship between Lori and John, as there's no compelling reason for her to stay with him other than the fact that she's the female lead, and there's not a great deal of chemistry between them. It's also fair to say that, just as with Family Guy, several of the jokes either don't work, go on too long or are pointlessly offensive, but the gag rate is high enough so that the film remains at least consistently funny, if not continually laugh-out-loud hilarious. On top of that, if you're even the slightest bit averse to Family Guy-style humour (essentially a mish-mash of rapid-fire pop culture references and extremely bad taste gags), then Ted may not be the movie for you. Despite a few flaws, this is an engaging, consistently funny slacker comedy with a terrific central performance from Mark Wahlberg.